In programming, reusable code is the use of existing software to build new software using the principles of reusability. Code reusability is considered a fundamental productive functionality in information technology intensive businesses. It is promoted in object-oriented systems by establishing relationships between classes. There are two fundamental ways to establish these relationships in object-oriented programming – Inheritance and Composition. Implementing inheritance is one way to relate classes but OOP provides a new kind of relationship between classes called composition. By establishing a relationship between new and existing classes, a new class can inherit or embed the code from one or more existing classes. In OOP, inheritance is the methodology by which an object acquires the characteristics of one or more other objects. It is one of the most powerful tools in implementing code reusability in OOP. 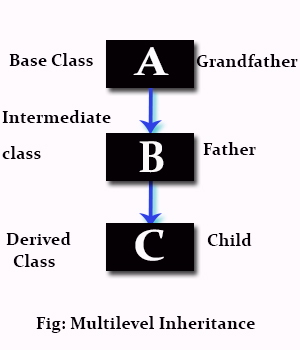 When using inheritance, a new class can be created by establishing parent-child relationships with existing classes. Object composition is an alternative to class inheritance. Using an object within another object is known as composition. On many occasions you’d want to use an object as a field within another class because it’s easy to create complex classes using previously written, well-designed classes as components. This is called composition. Well, both inheritance and composition provide equivalent functionality in many cases, object composition is a better reuse model than class inheritance. This article compares the two approaches. Inheritance is one of the most powerful tools in implementing code reusability in object-oriented programming. It refers to the functionality by which one object acquires the characteristics of one or more other objects. Inheritance in C++ means you can create classes that derive their attributes from existing classes. This means you specialize a class to create an is-a relationship between the classes which results in a strong coupling between the base and derived classes. Implementing inheritance promotes code reusability because new classes are created from existing classes. Class inheritance also makes it easier to modify the implementation being reused. But class inheritance has some downsides to it too. First, because inheritance is defined at compile-time, you cannot change the implementations inherited from parent classes at run-time. OOP provides yet another relationship between classes called composition, which is also known as a has-a relationship. If the features of one object need to be a part of another object, the relationship calls for composition. To compose a class from existing classes, an object of each class should be declared as the member of the new class. In simple words, using an object within another object is known as composition. Many a times, you might want to use an object as a field within another class. You use an object inside a class in composition. Unlike class inheritance, object composition is defined dynamically at run-time through objects acquiring references to other objects. Additionally, composition provides a better way to use an object without compromising the internal details of the object, that is where composition is useful. While both inheritance and composition promote code reusability in object oriented system by establishing relationships between classes and they provide equivalent functionality in many ways, they use different approaches. With inheritance, you can create classes that derive their attributes from existing classes so while using inheritance to create a class, you can expand on an existing class. On the contrary, using an object within another object is known as composition. Object composition is an alternative to class inheritance. If the features of one object need to be a part of another object, the relationship calls for composition. In inheritance, you specialize a class to create an “is-a” relationship between the classes which results in a strong coupling between the base and derived classes. It enables a hierarchy of classes to be designed and the hierarchy begins with the most general class and moves to more specific classes. By implementing inheritance, member functions from one class become properties of another class without coding them explicitly within the class. In composition, you use an object inside a class and any requests to the object are forwarded to the object. The internal details are not exposed to each other in composition, so it is a “has-a” relationship. Class inheritance is defined at compile-time, so you cannot change the implementations inherited from parent classes at run-time. Because inheritance exposes a subclass to details of its parent’s implementation, it often breaks encapsulation. Any changes in the parent class will reflect in the subclass which can create problems when you try to reuse a subclass. Object composition, on the contrary, is defined dynamically at run-time through objects acquiring references to other objects. And because objects are accessed solely through their interfaces, it won’t break encapsulation. Any object can be replaced at run-time by another object as long as it has the same type. On many occasions, you’d want to use an object as a field within another class because complex classes are easier to create using previously written, well-designed classes. This is where you use composition. Inheritance provides a way to reuse code by extending a class with minimal effort, this is why inheritance is a valuable tool in establishing relationships between classes. In general, it is preferable to use composition as it provides a way to use an object without compromising the internal details of the object that is where composition is useful. Inheritance is not without problems, but like inheritance, object composition raises similar performance concerns with regard to object creation and destruction. Sagar Khillar. 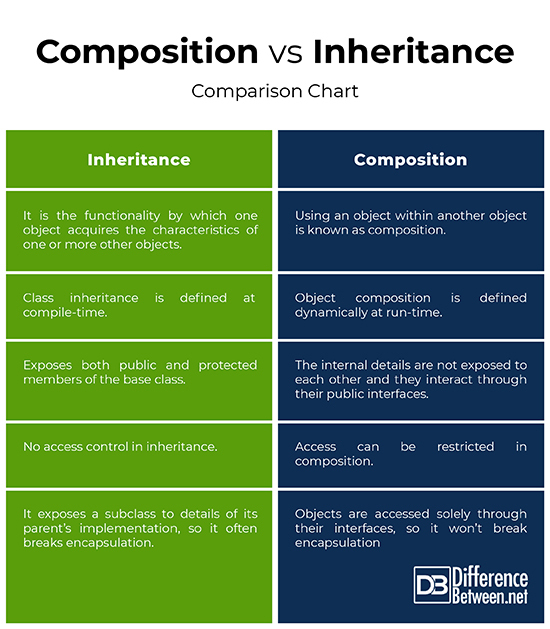 "Difference Between Composition and Inheritance." DifferenceBetween.net. January 29, 2019 < http://www.differencebetween.net/technology/difference-between-composition-and-inheritance/ >.